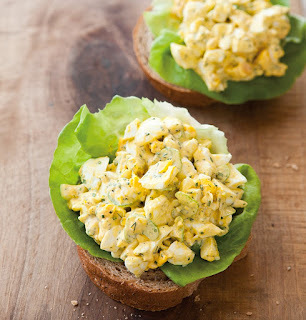 A classic egg salad recipe is one of those essential recipes. Get this family favorite, simple, classic egg salad recipe you'll use time and again. ~ Reserve and refrigerate 4 center egg slices for garnish, if desired.Chopremaining eggs. ~ Mix mayonnaise, lemon juice, onion, salt and pepper in medium bowl. Add chopped eggs and celery; mix well. Refrigerate, covered, to blend flavors. ~ Serve on lettuce leaves, garnished with reserved egg slices.